This bride had gotten ready in the bridal suite at Aldie Mansion, a wedding venue in Doylestown, Bucks County. This wedding venue is an English country estate with interesting architecture both inside and out. Here I posed the bride by one of the many beautiful leaded glass windows, and turned her so a ray of sun would light her face. Aldie Mansion is a Tudor-styled estate built in 1927, and is located in Doylestown, Bucks County, Pa. The original oak-paneled library, the Great Hall and the Boardroom all feature beautiful and distinctive fireplaces. 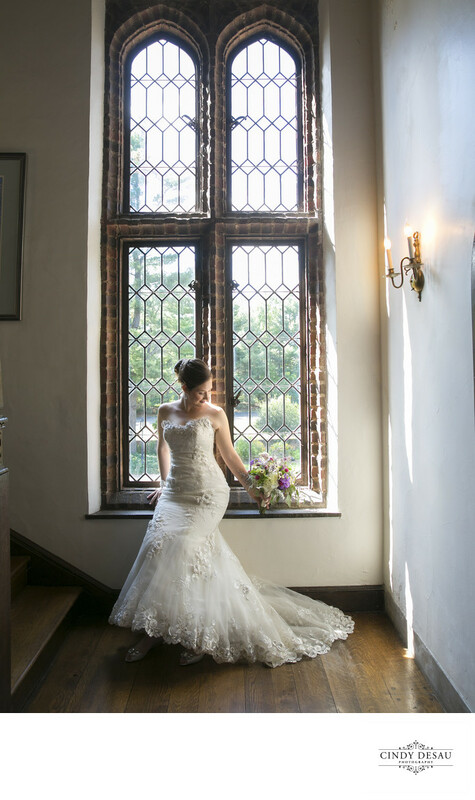 The leaded-glass windows are architecturally unique and, as you can see here, are wonderful to incorporate in wedding photographs. The bridal suite offers a balcony overlooking the terraces and splash fountains. Many brides and grooms have chosen to do their toasts on the balcony with their guests gathered on the terrace below. This also makes for amazing picture possibilities on the wedding day. Location: 85 Old Dublin Pike, Doylestown, Pennsylvania 18901.